Why the 2005 Mazda Mazda3? Razor sharp handling, more like a go-kart than a car. It feels like a budget BMW 3 series but wit not quite as precise on-center feel. The car sticks to the road well, well-weighted steering feel. Nice get-up-and-go for a 4 cyl. and automatic. 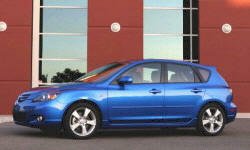 The 2006 and later models had a 5 speed automatic for the 2.3L engine which should improve things. Nice sound when revved too. Quick, and I mean, quick acting brakes. The thing stops on a dime and has good pedal feel. Car has front and side/thorax airbags, along with ABS and brake force distribution. Clean without flashy. Instrument cluster looks great with the deep-set binnacle design and electroluminescent gauges. Easy to operate controls. One of the better designs for a small sedan. Clean lines, especially the roof line. Why Not the 2005 Mazda Mazda3? Not the best for a small sedan. Expect only 24-25 in the city, no better than 30mpg on the freeway. Geared for acceleration so the engine turns at high rpm in city traffic (nearly 2500 rpm), and on the freeway at 70mph the engine is over 3k rpm.